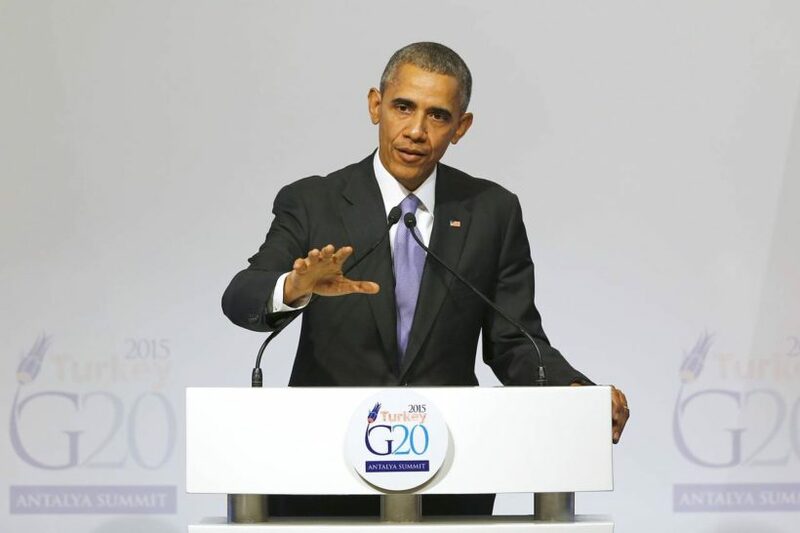 President Obama at the G20 in Turkey addresses the refugee crisis. (by James Taranto, The Wall Street Journal) – As of Monday morning a handful of governors were vowing to resist Obama administration plans to resettle Syrian refugees in their states. As of Tuesday morning, CNN put the count at 27, with only seven governors, all Democrats, saying their states will welcome the Syrians. President Obama likely helped catalyze this cross-country revolt with a dreadful performance in a press conference yesterday at Antalya, Turkey. When I hear folks say that, well, maybe we should just admit the Christians but not the Muslims; when I hear political leaders suggesting that there would be a religious test for which a person who’s fleeing from a war-torn country is admitted, when some of those folks themselves come from families who benefitted from protection when they were fleeing political persecution—that’s shameful. That’s not American. That’s not who we are. We don’t have religious tests to our compassion. . . . When Pope Francis came to visit the United States, and gave a speech before Congress, he didn’t just speak about Christians who were being persecuted. He didn’t call on Catholic parishes just to admit to those who were of the same religious faith. He said, protect people who are vulnerable. And so I think it is very important for us right now—particularly those who are in leadership, particularly those who have a platform and can be heard—not to fall into that trap, not to feed that dark impulse inside of us. The Obama administration is moving to designate the Islamic State’s murderous attacks on the Yazidi in Iraq an act of “genocide,” an extremely rare move intended to ratchet up international pressure against the terror organization, administration officials tell Yahoo News. The action, which sources say could be announced by Secretary of State John Kerry in the next few weeks, has been pushed by top officials at the human rights and religious freedom offices at the State Department. So Obama’s objection is not to “religious tests” per se, but to favorable treatment of Christians. It is of a piece with his February speech to the National Prayer Breakfast, in which he bizarrely lectured Christians to get off their “high horse” and remember the Crusades, while also claiming that ISIS and other Muslim terrorists are “betraying” Islam. Apprehension about admitting Muslim Syrian refugees is motivated by fear. It is “The Return of Republican Islamophobia,” according to the title of a piece yesterday by New York magazine’s Jonathan Chait. He writes that “figures like Ted Cruz and Jeb Bush are calling for the United States to admit only Christian refugees, thereby positioning the United States as indifferent to ISIS’s primary victims,” by which he means Muslims. So are Yazidis secondary victims and Christians tertiary ones, or the other way around? Chait doesn’t say. Authorities in France and Greece have said that fingerprints taken from the remains of a suicide bomber outside France’s national sports stadium, the Stade de France, match the prints of a man who entered Europe via the Aegean island of Leros on Oct. 3. Whoever the man was, he posed as one of the many refugees fleeing Syria’s war—including the violence of Islamic State—to enter Europe through its lightly controlled frontier in the Aegean Sea. Greek authorities on islands such as Leros, Lesbos and Chios have confronted thousands of arrivals every day in recent months as refugees and other migrants make the short sea crossing from Turkey in inflatable boats. Short of staff and equipment, Greek police carry out only a simple procedure that involves taking people’s data and fingerprints, and sometimes asking them a few questions, before giving them permission to travel onward, deeper into Europe. Upon his arrival in Leros, the Paris assailant was checked against police databases under his Syrian identity, Greek officials say. Nothing was found. Police on Leros didn’t spot that the passport was fake. A black market in Syrian passports has sprung up in Turkey as migrants try to gain the easiest possible entry into Europe, which has treated Syrian war refugees as more deserving of shelter in European Union countries than many other nationalities. The Obama administration plans to admit some 10,000 Syrian refugees next year. At Saturday’s debate, Hillary Clinton and Martin O’Malley both said they’d like to make it 65,000. “Accommodating 65,000 refugees in our country today, people of 320 million, is akin to making room for 6½ more people in a baseball stadium with 32,000,” said O’Malley. and the scandal at the Veterans Administration. His administration could not even design a properly functioning website for its central ideological vanity project, the federal health-insurance exchange. It seems crazy to place one’s faith in its ability to do better even than the Greeks in vetting refugees. “The one thing I feel very comfortable saying is there is absolutely no constitutional power for a state to exclude anyone from its territories,” said Stephen Legomsky, a Washington University of St. Louis law professor and former chief counsel of U.S. Citizenship and Immigration Services in the Obama administration. . . . The Refugee Act of 1980 requires the State Department to maintain “an effective and responsive liaison” with governors and mayors, but doesn’t give governors any formal role in resettlement. It’s certainly political, but resistance from governors in a majority of states—including 11 states Obama carried in 2012, and including one Democrat, Maggie Hassan of New Hampshire, who is seeking a U.S. Senate seat—it’s more than posturing. This is not just a national-security crisis but a developing political crisis for the president and his party. Published November 17, 2015 in James Taranto’s “Best of the Web” at The Wall Street Journal website. Reprinted here Nov. 19, 2015 for educational purposes only. Visit the website at wsj .com. 1. The purpose of an editorial/commentary is to explain, persuade, warn, criticize, entertain, praise or answer. What do you think is the purpose of James Taranto’s editorial? Explain your answer. Do you agree with his assertion? Explain your answer.